Have you been part of a cricket tournament where the winning prize is only for winners? Till now you played tournaments where winner takes all. Time is about to change. 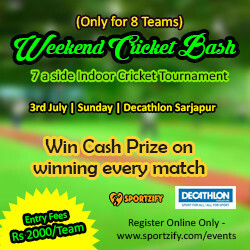 Sportzify brings you a indoor cricket tournament where every single team gets a chance to win something,Only if you play well my dear. You win a cash prize after winning each match. Each team will have 7 players playing on the field. Teams can have 2 substitute in their side but they will not be allowed to bat or bowl in the match if they are not in the playing 7. Teams can change their playing 7 in a new match. Under no circumstances teams will be allowed to play their substitute for batting or bowling. Each team plays 7 overs. Wicket Keeper is a must for each side. 1 run on two consecutive wide balls. One bouncer per over is allowed. If the ball goes directly outside the cage the batsmen will be considered out. If the balls goes outside on one bounce in the off or leg side then it will be given two runs. No over throw runs are there. If the ball touches the cage on the off side (direct or on bounce) it will be given two runs. The batsman can continue running even after the balls touches the cage. Participants are requested to reach the venue at 9:30AM or according to their match timings. Apart from tournament cancellation,under no circumstances the entry fees will be returned. Umpire's decision will be considered as final decision. Umpire holds the right to disqualify any team for any kind of misconduct. The winning prize money will be handed over in terms of cash. Tournament will finish within a day.